Its no replacement for a desktop PC, but if youre looking for an open ended new-gen console replacement, the Alpha ticks most boxes. Evidence has mounted over the last two years that there is a market for the PC-as-console experience, though the size of that market is still hard to measure. 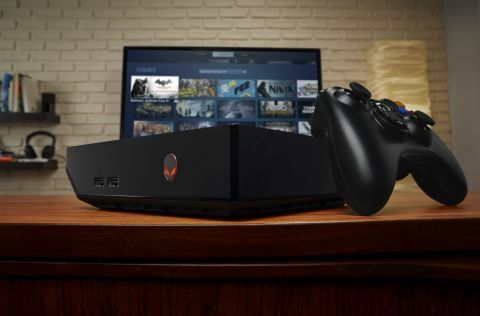 While Steam Machines were poised to start hitting the market in earnest in 2014, Valve’s delayed SteamOS and controller means hardware partners looking to enter this new market have been forced to wait. Alienware hasn’t waited. Instead, it’s opted to release a system operating on Windows 8.1. It’s ostensibly the same, just without SteamOS. The Alienware Alpha is a strange proposition: it arrives ahead of SteamOS, but it’s still very much a Steam Big Picture affair. While the Alpha boots into a bespoke Alienware UI, it’s basically a launcher for Big Picture mode. You can boot into Windows 8.1 on the Alienware Alpha but, given that the system isn’t shipped with either keyboard or mouse, you’re not really supposed to. Instead, you’re encouraged to navigate using the bundled Xbox 360 wireless controller. Based on what comes in the box alone, this is very much a gaming console. Which is fine, except during the rare instances when the Alpha crashes. This only happened once when I was using it, and it was a Steam software problem rather than the Alpha’s, but it does indicate that as a console experience, it’s not quite idiot proof. Having said that, modern consoles are also prone to the occasional (and sometimes more than occasional) crash. Metro: Last Light ran at a pinch above 60fps at 1080p on Medium settings. The Alpha comes at four price points, with the model we tested being the highest available. While Alienware is forthcoming about most of the specs, it’s been coy on the GPU, which is a customized Nvidia GTX 860M. The high-end Alpha packs an Intel Core i7-4765T processor with 8GB of DDR3 memory and—sadly but not unexpectedly at this price point—a 2TB mechanical hard drive. It’s possible to swap in an SSD, but in doing so you’d be sacrificing one of the Alpha’s strongest selling points: its price. While the drive’s speed is unlikely to bother the device’s target market—those used to Xbox 360 or Xbox One loading times—it’s likely to rub those used to SSD speeds the wrong way. As for that GPU, well, according to our benchmarks it’s similar to the GTX 860M with 2GB GDDR5. We tested it up against the recent Acer Aspire V 15 Nitro gaming laptop—which also packs a GTX 860M—and saw comparable performance, with the Alpha edging slightly ahead in games like Metro: Last Light, GRID 2 and BioShock Infinite. Those gaming framerates are fairly impressive, especially given that the Alpha is significantly cheaper than the aforementioned Acer. Metro: Last Light, for example, ran at a pinch above 60fps at 1080p on Medium settings, though jack the settings any higher and you’ll immediately encounter performance drops. Basically, it runs as well and looks a bit better than the Xbox One and PS4 versions of the game. And that’s the thing: the Alpha is basically a laptop gaming PC in a discreet, 20 x 20cm box. It doesn’t get as hot as a laptop, with the GPU temperature sitting around 79 degrees celsius, nor is it any louder than an Xbox 360, though the fan did kick into gear during heated moments in Metro: Last Light. Its main components (CPU, memory and hard drive) are replaceable, except for that custom GPU hardwired to the motherboard. Significant memory upgrades will be a hassle, since there are only two slots here, but if you’re a serial upgrader you’ll probably want to steer clear of the Alpha anyway, despite the unit’s innards being a simple four screw affair. The screen you see upon booting up the Alpha. The Alpha's bespoke UI offers a minimal yet functional set of customisation options. The alpha has a series of hotkeys triggered by controller button press configurations. This is how access to the Alpha UI looks mid-game. Navigating Steam Big Picture mode with an Xbox 360 controller is as pleasant as it is on a desktop PC, with controller compatible games clearly indicated. There’s even a category for controller games, if you want to avoid anything requiring a keyboard and mouse. I spent a couple of hours playing Eldritch on the couch and it felt like the game was made for console, though it did boot automatically into a windowed screen. Thankfully that was easily fixed in the game’s settings menu. The obvious benefit of the Alpha over the new consoles is Steam’s gargantuan games library, though only a fraction of the titles are compatible with a controller out of the box. That’s not a problem, though the one thing the Alpha sorely lacks over its console brethren is easy media playback. While it’s possible to exit to Windows for this, it’s an incredibly clumsy solution for a unit which wants you to forget about Windows. Both the Alpha’s barebones UI and Big Picture mode lack easy video playback, though Steam Music is intact. It’s possible to create a Favourite tab in Big Picture mode linking to desktop versions of YouTube, Twitch or Plex, but it’s not fun to use. Even plugging a USB drive containing an AVI will require exiting to Windows. With media playback a huge selling point on consoles in 2014 it’s a weird oversight, though there’s no reason Alienware can’t patch an app in some time in the future. I strongly suggest they do. As for the Alpha UI itself, it’s a simple affair which can be accessed at any time via a controller shortcut. Apart from acting as a gate to Big Picture, it features simple display settings (resolution, screen scaling), the ability to customise the Alpha overlay theme with different colours, as well as network customisation. Of course, it’s possible to forego both the Alpha UI and Big Picture mode entirely in order to use the Alpha as a Windows machine, and at this price point it might be a good solution for some, especially given its size. It’s tricky to put a value on the Alienware Alpha, as most folk reading this will already own a desktop PC because they prefer it over a console experience. And while it can’t compare to a desktop for sheer power, for anyone looking for a discrete little PC that can quietly sit in the living room, this is a great unit for the asking price. So long as you’re willing to sacrifice some of the flexibility of a desktop—or are at least prepared to forego the Alpha UI in order to access Windows 8.1 proper. If you’ve got money pouring from your every orifice then the Alpha would make a perfect second PC due to its portability. On the other hand, if you love gaming on a PC but dislike all the fiddling associated with it, you could make the Alpha your primary device, but it’s not as upgradeable or powerful as a real desktop PC. If you’re willing to wait, it might be worth holding out for Steam OS to properly launch, and the ensuing deluge of Alpha competitors to arrive on the market. In the meantime the Alpha is an impressive unit for its size and price, but it’s unlikely to win over anyone in the market for a new console, much less the very dedicated gaming PC owner. There is, believe it or not, a grey area, we just don’t know how big it is yet.